In a previous article, I noted that recent auction winners that promised utility-scale PV for around US$20 per MWh (2 cents per kWh) will need to beat the recent trend in average U.S. PV costs to be profitable. How will they get costs down to the levels they need? 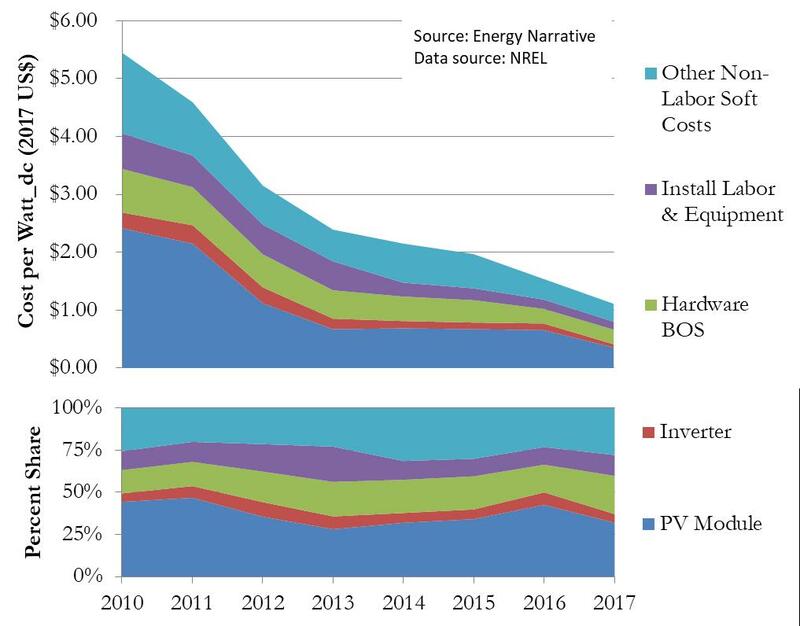 NREL tracks five main cost components for utility-scale PV systems: the panels themselves, the inverter that converts the produced DC power to AC power for the grid, balance of system (BOS) hardware, installation labor and equipment, and other non-labor soft costs (including overhead, permits, land costs, transmission connections, and contingencies). Figure 1 below shows how each of these components has helped cut average U.S. utility-scale PV costs from US$5.44 per Watt_dc in 2010 to US$1.11 per Watt_dc in 2017 (all in constant 2017 dollars). Panel prices have declined the most, but all cost components have come down significantly. Indeed, each component accounted for roughly the same share of the total in 2017 as in 2010, with the panels accounting for slightly less and BOS hardware slightly more. The graphic suggests two ways to beat the cost trend: start with overall costs that are lower than the U.S. average, or cut costs more rapidly than the historical trend. To examine the first option, Figure 2 compares panel and non-panel balance of system costs over time. For any given year, a project with lower-than-average panel costs would shift the data point to the left, while lower-than-average balance of system costs would shift the data point down. The grey dashed lines denote total installed cost levels. The red dashed line shows the installed cost that would have to be achieved to provide a 12% rate of return on a 20-year, US$20 per MWh contract (see my previous article for the assumptions behind this – changing the assumptions would, of course, shift this line). The countries that saw the lowest auction bids last year (Chile, Mexico, and Saudi Arabia), likely have non-tradeable balance of system costs below average U.S. levels. This suggests they may have an easier time reaching the red dashed line. These costs are a small share of the total, however, and so they will still need to reduce total costs from 2017 levels to be profitable. Figure 3 projects the future cost of each system component if they continue to decline along the 2010-2017 trend. 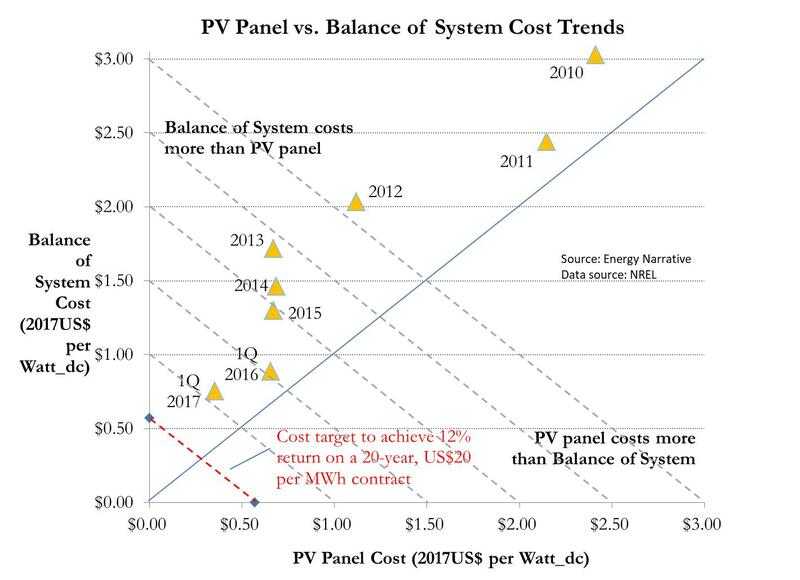 This suggests that the real cost of panels per Watt_dc would drop to US$0.18 by 2020 and US$0.05 by 2025 (in 2017 dollars). The real cost for the balance of the system falls below US$0.50 per Watt_dc by 2020 and to just US$0.17 per Watt_dc in 2025. Can costs really continue to fall at this pace? These learning curves are driven by exponential growth in total installed PV capacity. PV costs are now low enough, and PV is still a small enough share of global electricity generation capacity, that installed capacity could continue doubling for many years. Even so, each doubling of capacity may require more time to achieve as the numbers grow larger, thereby slowing the pace of cost reductions. This suggests that speeding up the pace of cost reductions will be very difficult based on the learning curve alone. 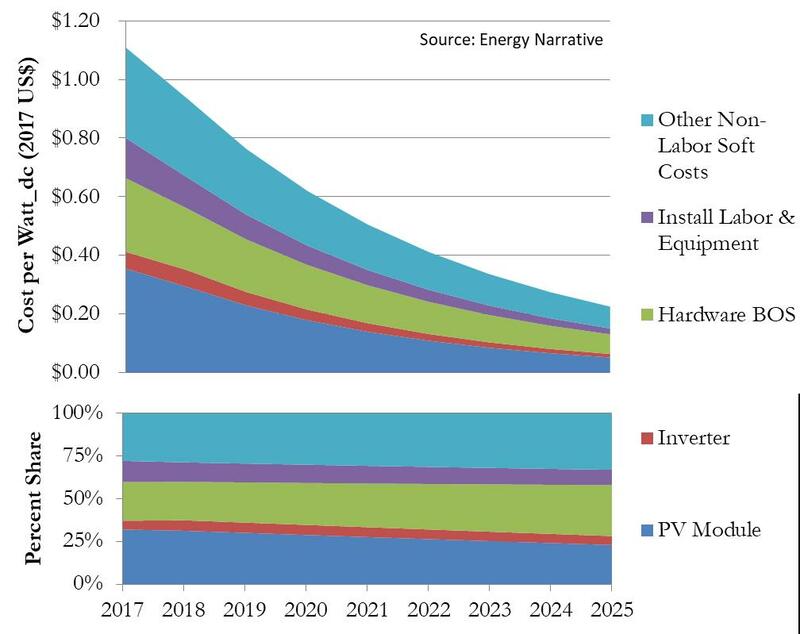 While technological advances also contribute to cost reductions, it is not clear that they will provide a step change in PV cost trends in the next two years. The profitability of last year’s ultra-low bids will come down to project-specific factors and the companies’ ability to execute. If they are unable to reduce costs in time, they may decide it is in their best interest walk away from what would be an unprofitable project, or at least seek to delay completion until costs decline sufficiently to make them profitable. Indeed, given the observed cost trend line, delaying a project by six months could make a substantial difference in the ultimate profitability. This means that the contracting entities—the electric utilities and governments that are buying the PV output—are also taking on risk. They must ensure that the contracts they sign with the auction winners have non-performance penalties that are sufficient to cover the risks that they face: a contract for new capacity that is needed to meet growing demand represents a high risk; one that meets a mandated—or voluntary—renewable energy target, less so. If you liked this article, consider signing up for our research notifications. Just add your email below.